The media often depicts a European Union that is unraveling. The financial crisis, high unemployment, and demands for austerity for as far as the eye can see have undermined confident in the European project. Syriza and Podemos from the Left, and the likes of the National Front and the Northern League on the right, are squeezing the center in a pincer-like movement. 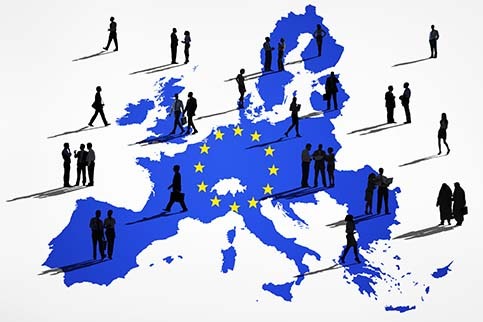 The latest survey results from Pew Research Center suggests that support for the European project is not as weak as this conventional narrative suggests. Moreover, Pew found that pro-European sentiment was stronger among young people. This is despite high levels of youth unemployment. The first Great Graphic shows the percentage of people with a favorable opinion of the EU. It shows the change 2013-2015 for selected countries. Over this period it rose in all countries save Germany. Of the six countries reviewed, less than half of those surveyed had a favorable view of the EU in 2013. This year more than 50% in all the countries have such a view. The median was 52% in 2013, and this has risen to 61% this year. In the UK, where Prime Minister Cameron has promised an in/out referendum, those with a favorable view of the EU has risen from 43% to 51%. 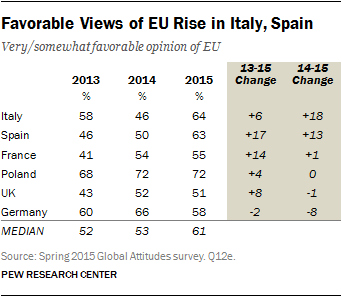 Favorable views of the EU are the highest in Poland, Italy and Spain, while the core (Germany and France) are lower. Ironically, the narrative we often hear is that the EU is driven by German and French interests. The survey found that the 18-29 year old cohort has greater favorable perceptions of the EU than the countries as a whole. However, it too took a hit during the crisis. Although it is gradually improving, it still is below the pre-crisis levels. All six countries show a clear majority of young people have favorable views. The median in 2015 is almost 68%. When asked if economic integration has been beneficial to their economies, this cohort is more skeptical. Less than half in three of the countries agree. Italian youth stand out with only 12% seeing economic integration as beneficial. This is down from 29% in 2007. European Union is not monetary union. This second Great Graphic shows in Spain, German, Italy and France a clear majority of people want to keep the euro rather than return to national currencies. And this sentiment has increased in all four countries since 2012, despite the crisis and debates of how to go forward. It is also noteworthy how similar the results are for Spain (71%), Germany (72%), and France (71%). Italy stands out at 56%. The extent of support for keeping the euro among Germans will likely surprise many observers. It also illustrates why talk that Germany should withdraw is not politically realistic. It expresses the view of a small, even if vocal, minority. It means that an astute politician like Merkel probably is not really worried by the rise of the AfD, even if it provides a handy justification to tout a hardline when negotiating within the EU and EMU. Pew also asked people in the UK about EU membership. It found 56% favor staying in the EU, while 36% favor leaving. It found 9% were undecided. Politically, it means now that Cameron has been elected and with a majority, he need not coddle the anti-EU backbenchers. He is more popular than his party, and the smallest of successes in negotiating with the EU, will likely be sufficient for him to endorse continued membership in the EU. Cameron can negotiate and opt-out clause to the "ever closer union", but the UK's obstructionist tactics have essentially achieved this already. Cameron will have allies in some efforts to curb welfare arbitrage and some immigration checks within existing treaties. Brexit is possible but unlikely. Just like Merkel seemingly belatedly recognizes the dangers of forcing Greece out of EMU/EU, her leadership may be necessary to find away to accommodate Cameron, or appear to do so.